As many of you know, we create training courses for the ScanNCut, so when a new machine is about to be released, we are right on it. 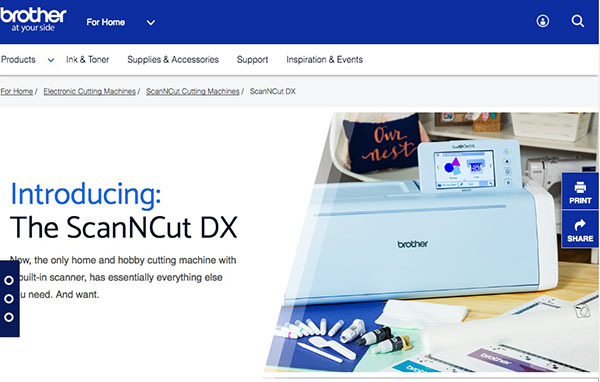 The new Brother ScanNCut DX is the latest in the Brother range of ScanNCut machines with a whole host of new features that many will love. But is it all good? Let’s take a look and see. We are eagerly waiting on getting our hands on the new ScanNCut DX Machine so we can bring you new tutorials. US Model Numbers: SDX125 and the SDX225. If you do, you will be able to purchase the machine from Echidna Sewing. This machine looks good on paper. In fact, it looks really good. There are some amazing features that I think a lot of people are going to love. If the Auto Blade Detection feature works as it says then it will solve 90% of the problems people have with their machines. And the Roll Feeder is a great addition for those cutting vinyl and wanting to create bigger projects. Plus, the ability to import PES files and convert them without any hassles is going to save a heap of time for those that applique. They’ve incorporated a lot of good features in this machine, but the proof is in the pudding. When we actually get one in our hot little hands we will let you know what we think but in the meantime, here is a list of the new features. NOTE: Please be aware that the features listed below are for the SDX225 USA (SDX1200 AUS) model numbers. The SDX125 USA (SDX1000 AUS) models do not have as many features. Please see our ScanNCut DX comparison post if you want to view the differences. The most exciting addition to the new ScanNCut DX machine is the Auto Blade detection feature. If you have the ScanNCut 1 or 2, then you will know that in order to cut something you need to change the blade setting in just the right way for the particular paper, cardstock, fabric or whatever, you are going to cut. With this new ScanNCut DX machine, you no longer need to do that. The machine senses the thickness and then adjusts the blade depth automatically for you. The ScanNCut 1 & 2 had a maximum cutting thickness of 2mm. The new ScanNCut DX machine will cut up to 3mm. If you’ve ever tried to scan on the ScanNCut, you’ll know that you need nice clear illustrations to get a good result and it’s often a struggle to get those good results. The new machine may make it a whole lot easier as it has up to 900 dpi as compared to the previous models which only had 300 dpi. The new ScanNCut DX is less noisy when cutting and scanning compared to the previous models. This is a nice feature especially if you are working at night and don’t want to wake the rest of the household. It’s great for us as we won’t have to adjust the audio when editing our videos. This is an awesome new feature! The new machine has the ability to cut up to 5.85 feet or 70.2″ in length without a mat. The maximum cutting width is 9.9″. The ability to be able to cut that length is brilliant particularly for those who cut vinyl. The machine has a roller blade feeder function that allows you to use vinyl rolls. However, the Roll Feeder is an optional accessory which means an additional cost so keep that in mind. At this point, we have no details on the cost of this accessory. The half cut setting is a new feature on the ScanNCut DX. This is essentially an option for those cutting vinyl as it allows you to cut the top of the vinyl without cutting the backing. I’d like to see this in action before making comment on this one, but if it works as it says, anyone who cuts vinyl will absolutely adore this feature. The new machine has over 1300 in-built designs. The ScanNCut 2 has over 1100 so a couple hundred extra designs are included. The number of fonts is 17 on the new machine as compared to 15 on the ScanNCut 2. I’m not 100% sure on this one, but it looks like this new machine reads PES/PHC/PHX files without the need to convert them to applique first. I am hoping this is the case at it will make it super simple to convert part of an embroidery file to a cutting file. From what I can tell, the Stitch Detection Mode allows you to create a file from the stitches in a PES/PHC/PHX file. Still trying to figure the exact process of this one so will add more as I find out more. The new ScanNCut DX now has a decent storage area….FINALLY! The storage is found in the flip out lid and looks pretty decent too. It holds quite a lot of accessories. I am still trying to work out the sizing of the screen for this new machine. Somethings not right. It looks smaller than the screen on the ScanNCut 2 even though it is supposed to be bigger at 5″ as compared to 4.85″ on the ScanNCut 2. The ScanNCut 2 screen is wider whereas this one appears to be more square so not sure how they are calculating the measurements. Let us know in the comments if you are going to be getting the new ScanNCut DX. You might also want to check out our post on the comparison between the SDX125 and the SDX225 versions of the ScanNCut DX. I am planning on getting the new scan n cut after I see it.I really like the auto blade detection, it should save some depth testing. I love it as well. If we don’t have to worry about getting the correct blade size every time it is going to make an enormous difference to the success rate when cutting. I have already told my dealer I want one. The new scan n cut dx looks amazing just wondering if you could cut 2.5 strips by 44 inch fabric for quilting ? Hard to tell at this point but I am thinking probably not. I think the Roll Feeder is for vinyl only. I would love it to be for fabric as well. I’m cautiously optimistic that the new SDX will live up to the hype. I’ve never had a problem with Brother products in the past and don’t ever recall them overselling a product so I’ve got my fingers crossed. I would be delighted with it just being quieter and having the automatic blade depth adjustment would be a real improvement – that in itself will get me to part with my SNC2 in favour of the new model. I spend more time testing blade depth before running my actual work through than anything else. I’d have been happy enough with a dial (like the Cricut Expl.2) to adjust blade depth. Looking forward to being able to cut thicker fabrics (would this go for leather too do you think?) too, and cardstock. Anyway, I can’t wait for you to give a review. And let us know what you think of the colour, shape and size, I’ve been underwhelmed so far by the new model’s colour. I know that’s a small thing, but I love the style and colour of my SNC2. That’s my feeling exactly…’cautiously optimistic’. I think if it can cut 3mm it should have much better success at cutting thicker mediums. The current machine can cut leather but the new machine should make it so much easier. As for the colour, shape and size, at this stage for me, it’s not the most attractive looking machine. The previous models have a much more modern look to them. This one looks a little clunky. Maybe in person it will look better. That’s the trouble the depth of cut of 3mm is for only felt and foam sheet. I am so confused about buying a machine now. I purchased the SNC DX125. At this point I cannot recommend it. Although it has some awsome new features, it absolutely cannot cut small detailed files. Curly fonts with swirls, forget about it. I have been on the phone and corresponding with Brother all this week. I only got canned responses, nothing that addressed my issue. This is my 5th SNC over the years, so I am no rube. It is imperative for me to be able to do intricate detailed cuts. The auto blade needs serious improvement. After hours and hours of changing settings in every conceivable way (to by pass the autoblade setting) I never once got a clean pull of vinyl on smaller items. I purchased all the accessories too. I sent a video, pictures of my results to Brother. Know what I got back? “looks like your design is too small? wait, what?? It cut on my 650 with ease! and this DX machine cannot? I challenged back, then I was told. The Hall sensor on the mat needs to be calibrated but can only be done by the dealer. I came back with “is this a warrantied fix”. I was told ” Only the dealer can say if it is a warranty situation”. I have had this machine for 6 weeks and have yet to get a decent cut on just about anything. Others in groups have told me they have no issues whatsoever, while some have experienced the exact same issue. Here is a good example. I have the FCM file on a stick, which I sent to my 650. it appears perfect on the screen and cuts beautifully. Take the very same stick, same design, to the DX looks great on the screen. Here is the deal, it i my opinion that somewhere in between the machine and the actual cut, the machine changes, yes, changes the format somehow. Swirled lines will not join. It is like you did not union weld or merge! The machine just cannot do it. There are also several videos out that clearly outline this issue. Unless Brother can fix this problem with an update, I will not recommend this to any SNC user, and certainly not to anyone that is brand new to SNC machines in general. As for updates, pffffft, the last one to fix the mat load issue, didnt work. Thanks for your comment Deborah. I get the feeling that some of the DX machines might be duds. Some people are having trouble with the mat loading but we haven’t had that problem as yet. We have been using ours for almost 3 months and it has worked perfectly. HOWEVER, we have only been using it to cut paper so far (as we are focusing on a DX paper training course) AND we haven’t cut really intricate stuff yet. So can’t really say how well it does in that respect. Yes, in Australia the retail price is $799. Not sure what the US price will be. At my dealer the price was US $599. They included the roll feeder with purchase. I think the roll feeder is free at the moment in the US, up until Christmas so you got in at the right time. Yes my first thought was ooo it’s ugly. but I suppose they needed opaque plastic for the accessory trays in the lid. As to the screen size, aren’t screens always measured diagonally? I don’t mind doing the blade adjustments and I don’t use vinyl in great long banners, so for me, nope, perfectly happy with my SNC1. And I rarely use the integral designs anyway, and I have a bernina sewing machine which can use PES but although I have an embroidery module I don’t use it much. So on balance, nope sticking with the machine I own. I do see though that for so many who struggle with the concept of the blade adjustments it’d be a godsend. but for me, I prefer to set things for myself. Yes, that’s what I thought too about the measuring the screen diagonally. I get the feeling that the new one is only bigger vertically. The ScanNCut 2 is bigger horizontally. That’s my theory anyway. I think I am already subscribed, or I wouldn’t be getting email from you, but I tried to scribe and never received any confirmation email. At any rate I received an email from Brother yesterday about the new scan and cut machine coming out. I still have the CM550. I have been thinking about upgrading. But will now of course wait until the new one comes out. I am super excited and can’t wait. Price will of course will be the deciding factor. So far everything I have seen about the new machine is positive. EXCITED. I am retired now and will have time to do lots of crafting. Yes, I think the price will be a deciding factor for a lot of people since it is dearer than previous models. In Australia it is retailing at $799. Not sure yet what the price will be in the US. And yes, you are definitely subscribed to our newsletter Shirley. So if you tried again, you wouldn’t receive a confirmation email since you don’t need to get one since you have already confirmed in the past. Just purchased mine last Wednesday…Oct 3rd….used it to cut cardstock, leather, burlap, etc….the blade DOES adjust….you can also adjust the “stack”…on the left hand side of the machine…from a position “1” to “2”…the machine will tell you if you need too…the extra images and the extra fonts are amazing!!!! !….Downside: total price is $845/roll feeder bundle w/ vinyl adhesive/and tax…..also YOU CANNOT USE SNC regular mats….you can ONLY USE DX MATS….real bummer! AND you can only load mats from one side…’cuz the other side has a hanging notch….ALSO, it does not accept any “scanning mats”…bad for us graphic artists….I’m glad I bought it, but I can see a lot of folks saying “pass”. I guess it’s Brothers way of generating a whole new source of income. Shame that you can’t use the mats as we have heaps of them now. And an even bigger shame that it doesn’t take the scanning mats. I love the scanning mat. I assume they will make one for this machine though. That’s not good. I have just been over to the HSN site myself and yes there are issues. I notice also that the mats are extremely difficult to find so maybe Brother has stopped distributing them. I am hoping it is just the mats that are the problem and not the machine itself. I am wondering if the roll attachment might have the ability to connect to my CM900? I’ve only had my machine since December 2017 and use it occasionally, but want to use it more. At present I just like looking at it! I am thinking that I’d like to cut vinyl to press onto the occasional T-shirt, perhaps when the new Cricut EasyPress comes out (of course this doesn’t depend on the roll attachment). Somehow I doubt it will work. It looks like it sits separate to the machine but the rolling in part is different to the previous ScanNCut machines. However, you can cut vinyl with the current machine just only at a maximum of whatever will fit on a 12″ x 12″ or 12″ x 24″ mat. I know that feeling. Technology moves fast and it’s tough trying to keep up but it’s always the worst when you have only just bought the thing and a new one comes out. Is there any way you can take it back? I thought Create and Craft said they won’t be a new scan n cut machine only new updates. We had heard the same thing. However, the DX has some functions that are more advanced and I doubt these could implemented in a software update. For instance the automatic blade detection. Here in Australia the higher end DX is approx. $100 more expensive than the CM900. There will be two models released. At this stage, I can’t see a release date for the ScanNCut in the UK. Even the homepage for ScanNCut UK has nothing about it. I just saw a link in my inbox to their website showing this new model. I’m pretty sure the latest Cricut machine has the auto blade setting and it was a big fail so I’m not counting on the Brother getting it right either. I love the idea that it can create stitch files for applique designs that you can scan right into the machine, but can’t one of the current Scan N Cut models do that? I was hoping to find out what they will be selling this for and found your article on Google. I thought it was suppose to release on August 6 but I don’t see it for sale yet. I would love to learn more about price in a future post. I for one will take a wait and see approach and read online reviews on how well it lives up to the marketing hype. That’s interesting to hear about the Cricut not working so well with their auto blade feature. Hopefully Brother have it right. It’s their biggest selling point with this machine so if they don’t get that right, then I think that a lot of people are just going to stick with the ScanNCut 2. I think the difference in terms of applique is that with the older model, your applique file had to be converted to Applique Data first. Will this model, you don’t need to…or at least I think you don’t need to. That’s just my assumption at this point, based on the wording on their website, but I could have it totally wrong. I’m still yet to see a price for US buyers. The only price tag I know so far is for Australia and that is going to be $799. The Silhouette Cameo 3 & Cricuit offers many of these new features but not all worked as expected during launch….. I’m looking forward to trying the new Brother machine out, this will be my first time using one!! I went with the Silhouette Cameo 3 bc of the ease of use within the software (almost like using a word document) but getting an image in that isn’t from their store is pretty tedious and time-consuming but I love that you can use any image right off the internet (does Brother offer this too?). They do already offer the auto blade but once it has a paper/vinyl/fabric jam- it has to be re-aligned, this can happen a lot if you’re working, again, with imagines you’ve created and not purchased from their site. Most know the silhouette does not offer the precision cuts the cricket machines offers—how’s the cutting specs on the Brother Machines, comparatively speaking? While the auto-blade feature can be nice, I hope Brother has improved the technology aspect & actual depth determination side of this concept. I’m (impatiently) waiting on this new Brother! I cannot wait to cut a piece of fabric either, even though I have purchased several fabric blades for the Cameo 3 as well as used several different backing stabilizers (and methods-including the parchment paper back), I still cannot get it to cut fabric…..remember those lovely jams that require recalibration?! Lol This has been the most frustrating ‘upgrade’ I was looking forward to on the Cameo because most of my crafting is in embroidery/appliqué/quilting. I’ve had to HTV and hand cut many projects due to time constraints……which is why I am so excited to switch to the Brother——and with even deeper cuts, I’m thinking of the ‘quilt as you go’ efficiency not to mention everything else it should be able to do—EEEEEKKKKK!! Also, I’ve read so many blogs and reviews (so I may have this totally wrong) but are they going to offer a Brother Package where you can get a Brother Appliqué/Embroidery Bundle that includes the SDX225 Appliqué Package & the Brother SE 600 Sewing & Embroidery Machine for around $799?! ( I was hoping the SE 600 was a 4” x 6“ embroidery area but it appears it’s a 4”x4”? I’m not sure if I could just add a larger hoop to ‘eye’ some of my projects…..unfortunately, my PE 770 hoops latch differently than in the SE400 for me to test but I’d love to get the SE600 (or the Project Runway combo) to save on mear hooping connection/disconnecting time as long as it doesn’t sacrifice the quality of my projects. I’ve tried a few different cutting machine brands except Brother—and I have NO idea why bc I own ‘sew’ many of their machines!! 😉 When they first release of the Cameo 3 and I ‘had’ to have it bc all the ‘extras’; auto-blade, 2 cartridges for everyday usable accessories like different blades, markers, pens, embossing, etc, the wireless connection (which was an epic fail!!!! IF the computer software would connect to my machine it would take forever to make a cut…lol); however, I’ve read several reviews months after that they corrected the issue but I’m still attached by the chord bc it’s so much faster. The PixScan never seemed to work for me either—I’m obviously electronically challenged!!! Does anyone know if cuts on this machine are accurate as the cuts on the cricket? I only wished they offered 2 cartridges on this new machine but I will be using it mostly for sewing so shouldn’t need the second cartridge unless I switch my vinyl over…..Oh, I’m soooo excited to purchase the Brother SDX225 for my birthday (since this will be my first Brother ScanNCut machine, I hope it’s as wonderful as their sewing products!! I love my new Brother 1034DX Overlock & PE770 Embroidery Machine…..in my experience, this machine has a steeper learning curve compared to the SE 400 so if you’re new to appliqué & embroidery you may want to start with the SE 4”x4” (embroidery only machine). I don’t have experience with the SE 600 but would love to minimize my collection of machines!! As for the look of the new Brother SDX225, I agree with many others that the previous models looked sleek bc this one looks almost exactly like my printer 😳. Thanks for this great comment Sara. I’ll do my best to answer any questions you have. First of all, the ScanNCut works pretty much in the same way as the Silhouette in terms of bringing an image in. Of course, not all images work as the software/machine can only do so much at recognizing the image but that also applies to the Silhouette. I don’t have any info on packages that Brother are going to be providing so no news on that yet. I also can’t compare the cuts between the ScanNCut and Cricut since we only have the ScanNCut. Hopefully someone else can chime in here if they have both machines. Would love to hear the answer myself. I too just got the Cameo 3 last Nov. Big disappointment, same problems wireless doesn’t work. Thanks for the info about the blade needing to be re calibrated! It was cutting right thru the vinyl, it was cutting high and to the side, it actually got chunks out of my new mat! I was so frustrated with it that a couple months ago, I started looking at the Scan and Cut 2 and have been obsessed since! Now I see a new model so glad I waited. I have a Brother sewing machine and the VE2200 embroidery machine and love them both! I will be calling my dealer! where did you hear the cricut autoblade was a big fail?? I have had mine for a while now and its perfect, I even have the deep cut blade and every other tool for it and its perfect. I even have the silhouette cameo 3 and that has an autoblade feature that works perfect too. “Autoblade” is Brother’s own approach at setting blade depth and pressure. With the Cricut Air 2, the user chooses their material on the machine dial in order to set pressure and depth- there’s usually no tweaking or prior knowledge needed, making it pretty easy to figure out and get right the first time. Hope this helps! Thanks for the comment Douglas. After having used the new DX, I am quite impressed with the autoblade. It doesn’t require adjusting at all. You simply load the mat with your paper or fabric and then cut. The machine works out the thickness of the material without any human intervention. Having said that however, I still like to do a test cut prior to cutting anything new. It is after all just a machine and we know that machines aren’t perfect. yes I want to purchase, curious price?? I have the 550 and 650 can I trade thes in on the DX? I’m not sure Rosanne. I would think that you would need to talk to the particular dealer in your area who is selling them and see what they have to say. As far as I can tell so far, Brother don’t have a trade-in offer for this new machine. I cant wait to get it ! Any release date yet? “Fall 2018” is all I can find and with fall fast approaching I am surprised that they can’t pinpoint the date a bit better. As yet I don’t have a release date for the machine in the US. I do know that in Australia the official release date of the machine to dealers is October 2nd. So I would guess that since Fall starts on September 22 in the US, then they would get it sometime between September 22 and October 2. Thanks so much for your feedback Susan. I see now that there are two models in the US. The SDX125 is probably the model that is sold online. The SDX225 is the model sold by dealers. Oftentimes they will have different features so I will research that a bit to see what they are. Not good that you have already cut through your mat. That’s the problem with automation, it doesn’t always get things right. I assume there is a manual override…yes?? We still don’t have a machine yet. The release date in Australia is October 2 so we are still waiting. I don’t think I’m going to go for the new machine right away. I’m going to watch and wait and think about it. Looks like it has great features but I’m just getting used to my brother my brother scan and cut 350, I’m in USA, and I don’t do the embroidery or the vinyl cutting so I don’t see how this would be a lot more advantageous for me. If they were giving them away I’d upgrade immediately. But, living on a fixed income, I need to consider these purchases very carefully. I’m so torn as to what to do. I have my Cricut and I’m very happy with it. Really the only thing I want the Scanncut for is to scan stamped images and have them cut out for me, so I don’t have to use the dies anymore in my sizzix. I have no idea if 300 dpi is good enough for regular black stamped images – like Lawn Fawn, or if the 600 dpi will really make my life that much more magical. I could really use some advise regarding the scanning. I can’t even think that I would make large vinyl signs where I would need a roller. That seems so unlikely to me. Ok all that seems A LOT of work, but that you very much for finding the video for me. I went ahead and got the Scanncut-2, so I’m sure that will work well for me. I got it from Amazon, so if I don’t like it I can pack her up and send her back for a refund. Gotta love Amazon for that. Thanks again!! We don’t really have too much info either at this stage. I don’t think the old blade holders will work but I could be wrong. It looks like the blade holder setup is completely different but perhaps the blades might be the same. So hard to tell at this point, because finding information on it at this point is difficult. Won’t be long before we get our machine so hopefully all questions will be answered. You could try contacting Echidna. They might be able to help you. Thank you for your reply. I am a bit worried about the accuracy of the auto blade after reading the comment further up. Thinking I might just upgrade to cm 900 as I am really only upgrading to get the wifi feature. Looking forward to hearing more about the do models though. That’s my concern as well, but maybe just hold off for just a couple of weeks because as soon as we get our machine, the auto blade feature will be the first thing we check. Hi Alanda, thank you for your reply. I spoke to someone at Blackmore and Roy in Perth today and she said the older blade housings still work in the new machine. You will also still need the deep cut blade and housing to cut denser material. Thanks Michelle. I had assumed they wouldn’t work so good to hear that you can still use the old ones. Hi, I have heard conflicting info regarding the blades and holders. It appears the older model blades and holders DO NOT fit in the DX models. But, I have spoken to users (in the US) who say they have cut Balsa and Bass wood on the 125 model using the standard auto blade. They didn’t say how the blades held up though. Also, still hearing of quite a few having trouble with loading the mat. I am now wondering if this issue will hold up the release DX 1200. I am guessing we should be hearing something soon. We are hearing conflicting information as well Michelle. We should have our DX sometime this week or early next week, so we will be able check out the things we have been hearing. We will start doing tutorials for the machine once it arrives. I purchased the new machine from HSN on Labor Day. I have had it for a little over a week and love the ease of it. I have used the Silhouette for years, but hated the constant changing of blade cutter and materials. I love the Scan n Cut and have successfully cut a number of items from paper and card stock. How is the auto blade feature working for you? Can you cut ultra suede or leather for appliques for western show clothes? It will just depend on the thickness of the leather but if it is for clothes then probably not. I would think it would be just too thick. Still difficult to know until we get the machine on how thick it is going to cut. Maybe you could look on ebay to see what they are going for.